← Dec 7, 2017 – The Anniversary of Pearl Harbor. Anything Happening Today? The glow of tinsel and winking Christmas tree lights are already warming many hearts. But as the Western world prepares for Christmas, the God of Israel is quietly engaged on a secret mission. He is turning the hearts of kings and presidents wherever He wishes, like channels of water in the hand of YHVH (Proverbs 21:1). Jerusalem is the hot button. And once again in response, the peoples are in an uproar. Why do the nations rage and the Palestinians call for days of rage (Psalm 2:1-2)? What is the significance of U.S. President Trump’s recognizing of Jerusalem as Israel’s capital? Does the Bible shed any light on this matter? The original American position on Jerusalem goes back to 1947-48 and is based on the United Nations General Assembly Resolution 181, adopted November 29, 1947 (https://en.wikisource.org/wiki/United_Nations_General_Assembly_Resolution_181). That Resolution calls for the dividing of the Land of Israel into “independent Arab and Jewish States.” It also calls for “the Special International Regime for the City of Jerusalem.” All the residents of the city would automatically become “citizens of the City of Jerusalem” unless they opted for citizenship of the Arab or Jewish State. The plan was never implemented, so on December 11, 1948 GA Resolution 191 restated “detailed proposals for a permanent international regime for the territory of Jerusalem.” This projected Jerusalem area stretched from Abu Dis (East) to Bethlehem (South) and from Ein Karem/Motza (West) to Shu’afat (North). The United States has never officially relinquished its original support of the corpus separatum. “The United States has never recognized such unilateral actions by any of the States in the area as governing the international status of Jerusalem” (344. Circular Telegram From the Department of State to All Posts; Washington, July 5, 1967, 8:55 p.m; 1508. Subj: Jerusalem Resolution in UNGA – https://history.state.gov/historicaldocuments/frus1964-68v19/d344). U.S. foreign policy is not controlled by the U.S. Congress. To this day official U.S. documents and web sites do not refer to Jerusalem as the capital of Israel. What is the Jerusalem Embassy Act? On 23 October 1995, the United States Congress passed an advisory Act called the Jerusalem Embassy Act (https://en.wikipedia.org/wiki/Jerusalem_Embassy_Act). It stated that “Jerusalem should be recognized as the capital of the State of Israel; and the United States Embassy in Israel should be established in Jerusalem no later than May 31, 1999.” Another similar law is the Foreign Relations Authorization Act, Fiscal Year 2003 – Public Law 107-228 – September 30, 2002 (https://www.gpo.gov/fdsys/pkg/PLAW-107publ228/html/PLAW-107publ228.htm). Under the U.S. Constitution the President has exclusive authority to recognize foreign sovereignty over territory (see Restatement (3rd) Foreign Relations Law of the United States, American Law Institute, 1986, §§ 203 Recognition or Acceptance of Governments and §§ 204 Recognition and Maintaining Diplomatic Relations Law of the United States). In May 1995 the Justice Department Office of Legal Counsel (https://web.archive.org/web/20100209074518/http://www.justice.gov/olc/s770.16.htm) concluded that the expected provisions of the Embassy Relocation Act would inveigh against exclusive presidential authorities in the field of foreign affairs and would therefore be unconstitutional. Since the U.S. Constitution reserves the conduct of foreign policy to the President, any resolutions of Congress in favor of legislating foreign policy have been seen by U.S. administrations as extremely problematic if not arguably invalid for that Constitutional reason. As long as the acting U.S. President and his State Department were opposed to recognizing Jerusalem as Israel’s capital, they could and did argue that Congress was attempting to usurp the Executive’s authority or power over matters of foreign affairs. What is President Trump’s White House proclamation? When President Donald Trump issued a proclamation from the White House on December 7, 2017 recognizing Jerusalem as the capital of Israel (https://www.whitehouse.gov/the-press-office/2017/12/06/statement-president-trump-jerusalem), he broke with a decades-old stance of the State Department, the Intelligence community and the military. But he aligned himself with decades of U.S. Congressional tradition and sentiment. • President Trump has now altered international debate on the Middle East. The leader of the world’s biggest super-power has gone on record affirming an ironclad connection between the Jewish people, their homeland and their capital city. • The majority of the Islamic world (slavishly followed by the UN and the European Union) refuses to acknowledge or validate the intrinsic right of the Jewish people to their homeland and their capital. This is part of the Islamist strategy to weaken and eventually destroy the Jewish state of Israel using both military and political means. • Trump’s declaration opens up a strong influence for change in the Middle East equation. It is undoubtedly also connected to strategic planning regarding Iran’s geopolitical threats to U.S. and Saudi influence in that region, as well as to shoring up political good will from both his Evangelical constituency and the more conservative wings of the Jewish community. o “The Egyptian, the Babylonian, and the Persian rose, filled the planet with sound and splendor, then faded to dream-stuff and passed away; the Greek and the Roman followed, and made a vast noise, and they are gone; other peoples have sprung up and held their torch high for a time, but it burned out, and they sit in twilight now, or have vanished. The Jew saw them all, beat them all, and is now what he always was, exhibiting no decadence, no infirmities of age, no weakening of his parts, no slowing of his energies, no dulling of his alert and aggressive mind. All things are mortal but the Jew; all other forces pass, but he remains. What is the secret of his immortality?” (https://sourcebooks.fordham.edu/halsall/mod/1898twain-jews.asp). Two hundred years ago, when a new Tsar arose in Russia many Jews would hold their breath. Would the new king be good or bad for the Jews? The more tolerant Alexander II was followed by the cruel and anti-Jewish Alexander III. In the same way, one U.S. President can be a breath of fresh air and make a wonderful proclamation, but this does not guarantee that the next President will continue the same course or have the same sympathies. The vast majority of Israeli Jews and most Jews worldwide are thrilled at President Trump’s proclamation and are very supportive of it. The small minorities of anti-Israel or ‘leftist progressive’ Jews are opposed to Trump’s declaration, as they are to most pro-Israel moves. The black humor in this joke is based on the fact that it is understood that both Jews are destined for death. Yet the second Jewish fighter somehow believes against all reality that if they both scrape and bow, perhaps the Nazi Kommandant might spare their lives. Some Jews who live in the Diaspora are afraid. If Israel proclaims its freedom and sovereignty too boldly, the anti-Semites of the world (be they neo-Nazi, BDS, Antifa, ‘Socialist Progressive,’ Christian or Islamist) may simply rise up and slaughter the Jews once again. Better to avoid angering the anti-Jewish psychopaths of the nations! Yet when the threat of terror causes its victims to hide and not to fight, it can be concluded that terrorism has succeeded in its aims. The Nazi juggernaut could not be blissfully ignored, as Mahatma Gandhi once suggested. It had to be defeated on the battlefield. The Imperial Japanese Army only sued for peace after terrible weapons were unleashed against its Empire. In order to vanquish a murderous jihadi attempt to re-establish the slavery of a world caliphate, only decisive and repeated victory will do. The response of the Islamic world to President Trump’s proclamation was expected. Islamist terror groups such as Hamas (www.dailysabah.com/mideast/2017/12/06/trumps-jerusalem-move-opens-gates-of-hell-on-us-interests-hamas-says) declaring that the gate of hell have been opened, presumably allowing the satanic Hamas to kill and destroy Israelis – something they have had no problem doing in the past under more friendly circumstances (www.aljazeera.com/news/2017/12/hamas-leader-jerusalem-decision-war-declaration-171207083427072.html). Islamic Jihad in Gaza declared that Trump’s proclamation was “a declaration of war…on the entire Arab and Islamic nation” (www.israelnationalnews.com/News/Flash.aspx/405059). Al Qaeda in the Arabian Peninsula (AQAP) declared that the proclamation is “a clear challenge to the Muslim world” and encourages its adherents to join in the jihadi struggle on this issue (www.reuters.com/article/us-usa-trump-israel-aqap/al-qaeda-condemns-trumps-jerusalem-move-calls-for-action-idUSKBN1E126H). World media has raised headlines to a fever pitch, prophesying that the entire Islamic world will nearly immediately break out into violence over this matter, and that Israel herself should get ready for mass violence and casualties. In some cases enterprising newspersons have gone out of their way to film ten Palestinians burning a photograph of President Trump as leading news on their networks. Melanie Phillips explains how Western governments and media are actually catalyzing Islamist violence through their anti-Israel media activism (www.melaniephillips.com/historic-watershed-shames-britain-europe/). King David once penned a psalm about how the nations of the world would rage against Jerusalem and attempt to frustrate God’s divine strategy for the Jewish people’s capital city. He who sits in the heavens laughs. YHVH scoffs at them. He said to Me, “You are My Son, today I have begotten You. Today we watch the sharks of the nations gnashing their teeth about President Trump’s proclamation. We bless the United States of America for their leader’s bold and courageous stand. 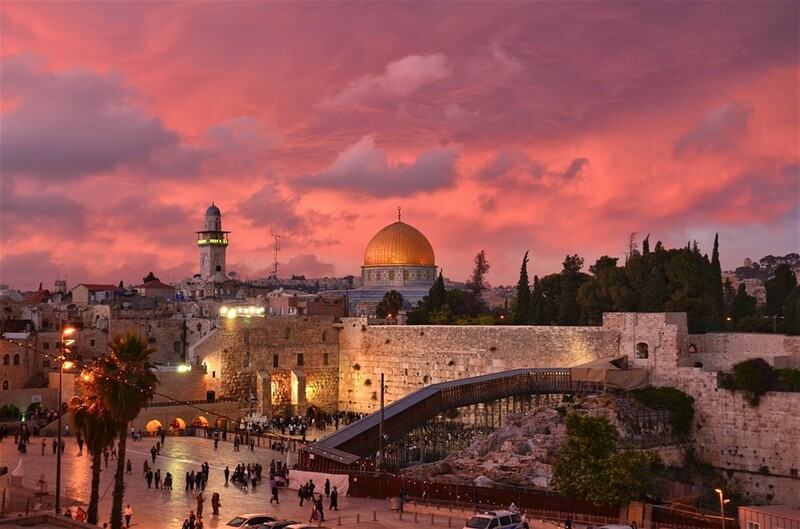 We pray for other nations to bow to God’s strategic declaration in Psalm 2 regarding His heart for the Jewish people, their homeland and their capital city.